Visit the collection of Impressionist works of art that are housed inside the walls of the former Orsay railway station. You will have the opportunity to visit the Musée d'Orsay, one of the most famous museums in the world for its collection of impressionist and floral art and you can jump the queues that often form at the ticket counters too. Discover the most beautiful works of art by the masters of Impressionism: Monet, Renoir, Degas and Cézanne. Amongst the thousands of works that are on show, some are truly unmissable. "The Absinthe Drinker" and "The Little Fourteen Year Old Dancer," by Edgard Degas, "Dance at the Moulin de la Galette" by Auguste Renoir and "Rosebushes under the Trees" by Gustav Klimt. The importance of the numerous works on display by the father of Impressionism, the famous Clause Monet, cannot be underestimated. But, if we are talking about masterpieces, there are more, as an entire gallery is dedicated to Vincent Van Gogh and his truly unique and unrivalled artistic talent. In order to avoid the queues at the ticket office, it is advisable to buy your tickets in advance. Choose the time at which you want your visit to start and click on the icon that says "Book Now." On the day of your visit you will simply have to show the tickets on your smartphone at Entrance C of the Musée d'Orsay (reserved entry). Do you need some more information before visiting some of the most important works that are housed in the Musée d'Orsay? 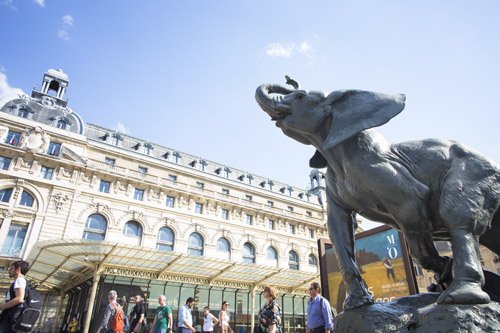 In our article entitled The Musée d'Orsay you can find all the useful information necessary for visiting the Museum along with all our recommendations on how to reach the museum with the Parisian public transport network. If you are a lover of Impressionism, we suggest that you also have a look at our article entitled The Musée de l'Orangerie.